High 'Legacy' skirt with blue, cotton pinstripe waist and linen mix skirt (47& Linen 43% Cotton 10% Polyester), the skirt attaches under the waist section. 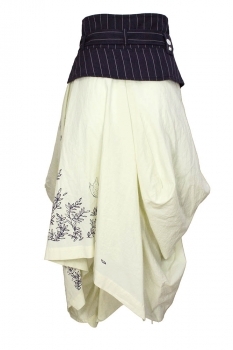 3 button fastening with crossover, inner button fastening for skirt. Pinstripe fabric belt, belt loops, the rear right belt loop is wider and has a 'High' metal stud and crystal attached.. 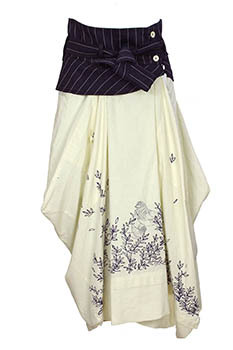 The skirt has blue printed birds and plants and has 2 pockets with button fastening. Front has hem panel. 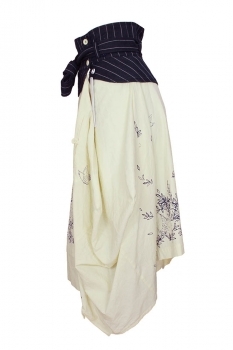 The skirt is asymmetric and beautifully shaped. A stunning Summer skirt.